Kellee Maize is an internationally-renowned independent rapper/singer, motivational speaker, activist, and entrepreneur based in Pittsburgh, PA.
Generally I am a lover, not a fighter, but I’ve had beef with the American political system for quite some time, and I know I am not alone in my opinions. My intention in writing this post is to give you some backstory, then some scientific info about how this election might be negatively impacting your brain, and finish with some powerful tools to reverse the damage. I believe the 2-party system is undemocratic and the electoral college is outdated (I could write a whole article on this topic alone so I’ll stop myself there). I had to grapple with switching from strongly supporting Bernie to understanding why I should be pro-Hillary (which I am, and again, this topic could make its own article. Allow me to point to several indigenous prophecies that have given me a lot of peace regarding this time in history where the "stewardship of the planet" was foretold to pass from men to women and the Maya have done so already. There is even an event in DC this weekend celebrating a Tibetan version of the prophecy! You can call me an idealist. Now that I have a kid I don't think I could survive any other way. But I have seen proof of concept in this scenario and believe strongly that indigenous wisdom and people are BEYOND important to apply and respect in these and all times.). Perhaps the hardest thing to accept regarding this election is that Trump could ACTUALLY become the president. It was a tough pill to swallow. I hit a breaking point when a CNN clip showed that Allegheny county was one of the most critical counties in the country for Trump to win. Pittsburgh is at the heart of Allegheny county, and it's my home. 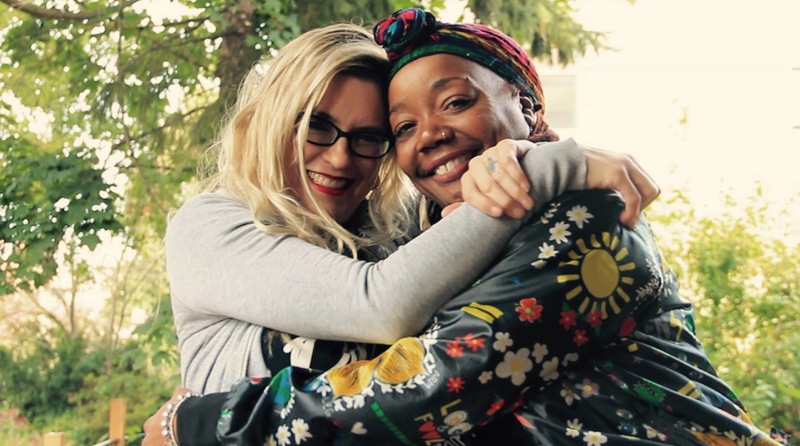 Then, as I spoke to some women of influence in the 412, like Liz Berlin of Rusted Root and Peachie Wimbush (my friend and Wiz Khalifa’s amazing mom, pictured above with me at our video shoot), and some dear friends like my BFF from college, DJ Bonics (Wiz's DJ), I realized I would have help. Revolutionary Punk-Rockers Anti-Flag stepped up within a few hours of reaching out to them, and even my biological father, Jimmy McNichol, who I just recently met said he'd get in on the action. Tweets and messages like what are pictured here kept pushing me forward. I decided I could pull something together with Peachie, my company Nakturnal, and MIC PGH. Writing music and producing video is, of course, my go-to in these situations. Yet, I still had a hard time writing because every time I got deep into researching, watching, and thinking about Trump, it exhausted me, mentally and emotionally. Sometimes I even felt physical pain and sickness. At one point I laid my head in disgust onto my kitchen counter and told my manager, Emily Plazek, I didn’t think I could physically handle writing this. She agreed it was stressing her out as well and to maybe just let it go… reluctantly, and cross our fingers. 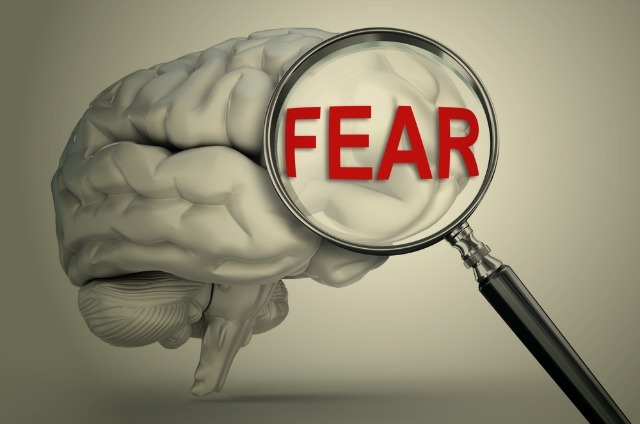 Apparently the fear centers in our brain, like our amygdala, inflame when we’re under negative stress (like when I am reading Donald Trump’s hateful and sexist rhetoric and considering that he could run our country!) Our brain’s lobes are literally damaged. I became even more determined to write and produce this work because this was new information for me, and certainly the rest of the American public might not be aware of the damage he was causing and using to maintain his loyal following. Perhaps Trump himself had some trauma in his life that led him to his behavior and made him not fully aware of the damage he is causing. Psychologists and media influencers are working hard to boil down the science behind why Trump supporters rally behind him despite his racism and bigotry. Some media personalities, like John Oliver, are combining intensive Trump research with comedy. 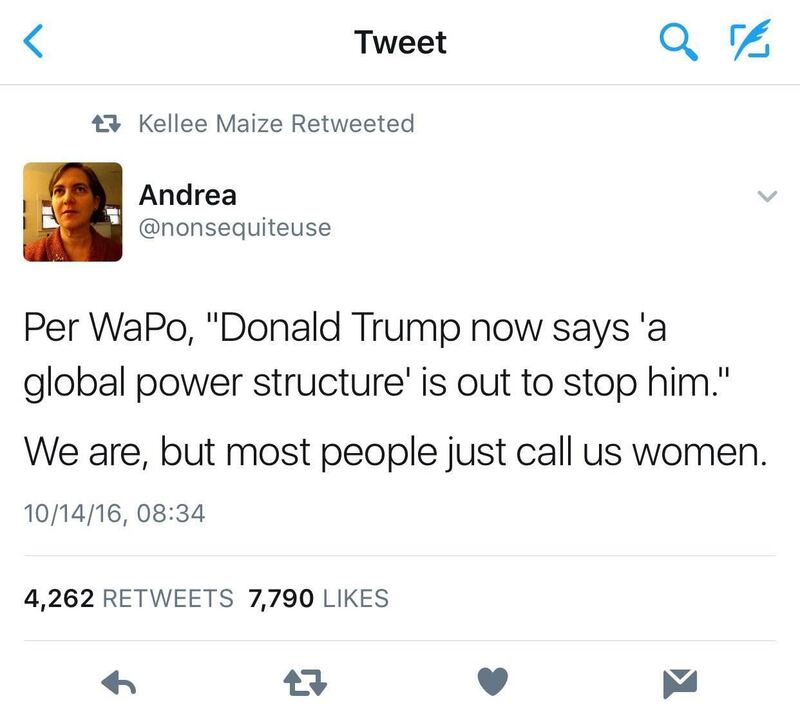 Others like Nerdwriter are studying Trump’s rhetoric -- like how he flips sentences in an illogical, repetitive manner to end on power words. Trump’s effects go deeper than facts and words, though. As I earlier mentioned, I’m blessed with the opportunities to learn this brain science with Vikki Hanchin, LCSW - a wholistic psychotherapist. She studies how excessive stress creates physical brain damage and her recent blog article distills her findings. Typical American culture tends to praise excessive stress for competitive reasons -- don’t get me wrong, I get stressed, I completely understand it. 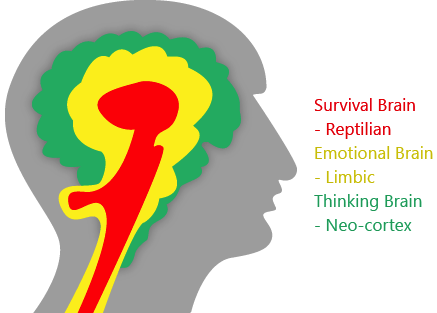 But when you are exposed to frequent stress, you over-activate your lower limbic and reptilian brain (lobes like your amygdala), and release cascades of the stress hormones cortisol and adrenaline, disrupting higher brain functions like conflict resolution and conscious awareness. Stress can be triggered by things you experience firsthand or simply witness, like on TV or the news. If you witness aggressive, hostile, angry, and threatening behavior; violence and scenes of destruction; or situations that create perceived threats to safety or well-being, your brain will react to the stress in a similar manner to you actually being in those situations. 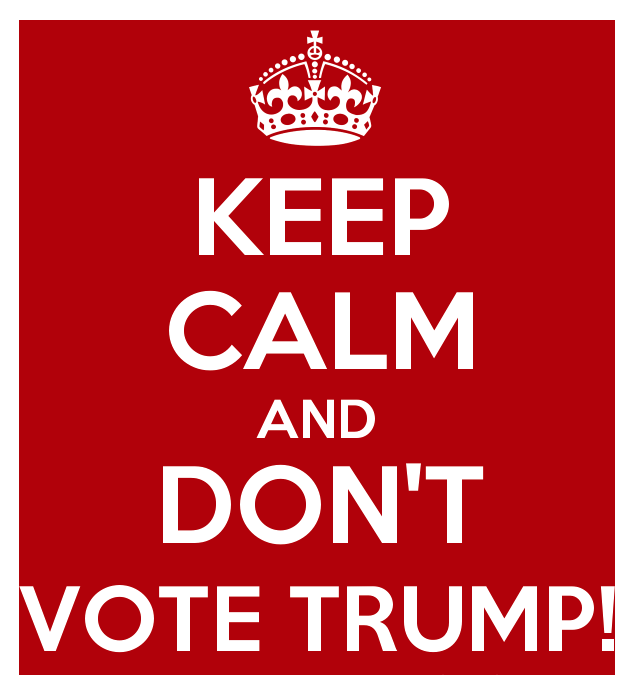 Trump’s antagonistic and verbally abusive campaign behavior puts viewers under this type of stress. Some social psychologists are applying “Terror Management Theory” to his rhetoric, making correlations to his supporters’ acceptance of his extremist platforms due to Trump’s forcing them into states where they fear their own mortality. One note I’d like to make, though: It is easy to hate on his followers, but consider that other traumas in their lives have primed them to fearfully follow, instead of thoughtfully examine what he is actually saying. Ruling with fear is effective and many good people learn to follow bad doctrine due to fear. The goods news is that you can repair your brain damage from this type of stress. Social media and the news have been praising the benefits of things like meditation, mindfulness, yoga, and exercise -- they’ve turned into hot trends in current culture (which I LOVE). That’s because they’re what Vikki calls “goodness generators” and these kinds of things heal the brain damage I’m talking about. There are a ton more: comedy and laughing with friends, spending time in nature, engaging in altruistic acts like charity, doing random acts of kindness to strangers, heart-focused activity, sending wishes of compassion to a friend who’s suffering -- the list goes on. That healing can go even deeper and more complex by adding other practices that are incorporated into effective psychotherapy, such as thought and feeling reappraisal and compassion -- but it really can be as simple as turning on a comedy show on Netflix when you’re feeling low, so that your brain can start to heal the inflammation that the stress physically caused on your brain. One of the most important discoveries that Vikki has made is that you can use a steady ratio of three positive experiences to offset each negative experience. Since the usual circumstances of most lives do not produce this 3:1 positive to negative experience ratio, we must produce these positive experiences ourselves. For this reason, when I made my statements about Trump in my video, I included tons of loved ones, friends, pets, laughs and hugs to offer up some goodness generation! To learn more about this brain science you can read Vikki’s full report here. Politically, first and foremost, your choice must be clear both to go out vote, and then not vote for Trump, because as corrupted as I believe our two-party and election system may be, we have to exercise our right to say that this is not the leader that we want to represent us and our future. Personally, each of us needs to recognize the damage done to our brains and work toward fixing that damage through those “goodness generators” for our own health. Music is one of the most powerful vehicles for communication and unity behind a cause-- and the cause here, for me, is to be sure that someone with Trump’s character, rhetoric, and ideals is not in charge of the future of our country. The other cause is to make sure we know that the more we are kept in fear states, the more easily we are harmed physically, manipulated, and controlled. But, we can always reverse the damage with Family, Friends, Pets, Humor, and Love, just to name a few. Sending you lots of Love, today and always! If you are interested in being part of our movement, to Make Love Not Trump, please go to our site and send us your own clips! We're making plans for all the clips we get! You can also support a small biz in Pittsburgh, our friends at Daily Bread, who were so inspired by the cause they wanted to help spread the saying through a T-shirt! Profits will be donated to the Standing Rock Sioux Tribe Dakota Access Pipeline Donation Fund. Check out some other artists who had similar ideas in speaking out against Trump! NSFW!! !